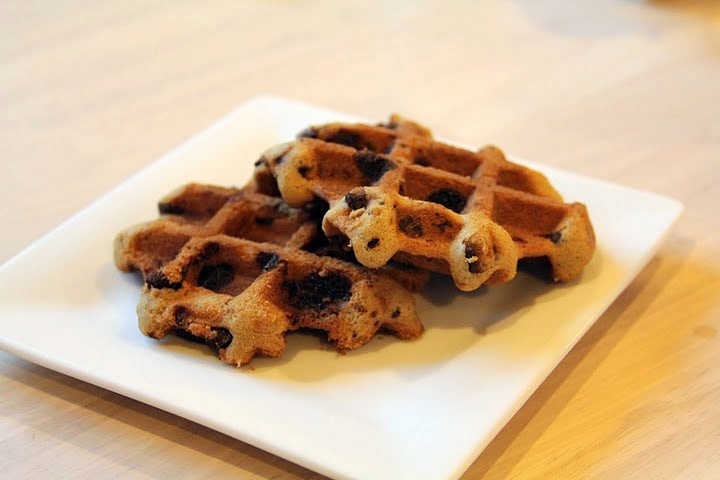 Waffle Cookies [recipe] – Cin Cin, Let's Eat! Last May while traveling, my sister spotted a recipe for waffle cookies in the Southwest Magazine. And of course I received an email about it as soon as she got home. It was an unique concept so I decided to give it a try. The batter was simple to whip up, and I’d imagine you can use most cookie batter but just make it slightly wetter than usual. The result was pretty yummy and crunchy, but not enough espresso flavor. Don’t expect the cookies to be chewy like oven-baked ones. They’re crunchy on the outside and sort-of cakey on the inside. The process was also very time consuming, as most waffle machine can only make 4-6 cookies at once, so that’s a lot of sitting and waiting. I am extremely impatient when it comes to waiting for something to finish cooking, so holding myself back from opening that waffle iron was a big challenge. Overall, I’d say it’s a fun way to make cookies, and the result looks pretty impressive if you were to bring them to a party. But in general, not really worth my time. 1/2 cup unsalted butter, melted and cooled. Heat waffle iron. In a large bowl, whisk the butter and sugar until smooth. Whisk in the egg and vanilla. Stir in flour, baking soda, salt, and espresso powder, then the chocolate chips. Coat the waffle iron with nonstick cooking spray. Use a tablespoon to portion out a cookie onto each waffle square. Close the iron and cook until beginning to brown, about one and a half to three minutes. Transfer cookies to a wire rack and repeat with the remaining dough. I used about 3/4 cup of chocolate chunks instead, I thought too much chocolate chunks in the batter will cause the cookies to burn quicker in the waffle iron. There was barely any espresso taste in the final product, I suggest putting in more espresso powder. Be careful not to overfill the waffle iron, it’s really not pleasant when the batter overflows and the stickiness and the melted chocolate get in the hard-to-clean parts on the back of the iron. Seriously, be patient. Don’t open the iron when you’re just curious to see if it’s doing anything… Usually the cookies are done when there’s no more steam coming out of the iron. My batch of cookies were done between 2-3 minutes. Here is another recipe from the same author (Lauren Chattman) but with a little bit variation.